Reach out to invite members of the Black Community to a special Come, Spirit, Come celebration for Pentecost. 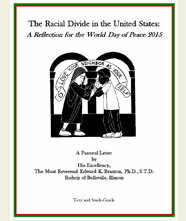 Reach out to the wider community to prayerfully discuss the study-guide The Racial Divide in the United States: A Reflection for the World Day of Peace 2015. This entry was posted in evangelization, outreach, Pentecost, racial equality, racism, World Day of Peace and tagged Black Community, cultural diversity, prayer, racial healing, racial inequity, racial justice, resources, Vacation Bible School on May 17, 2015 by Project Reach Out. This entry was posted in evangelization on May 17, 2015 by Project Reach Out.